Whether it is World War 1, World War 2 or any other war or conflict, this is a year when the big upheavals of the last century have been at the forefront of our collective memory, as well as any personal memory. The phrase “Lest we forget” comes from a poem by Rudyard Kipling, and has been used to remember and commemorate those lost in combat. My generation have and had parents who survived World War 2 and grandparents who lived through World War 1. My cousins recovered a photograph of my late maternal grandfather who survived both World Wars. He is featured here in a photograph taken in the 1930s, third from the right. Lucjan Zaleski was an officer in the Polish Army, having first served with the legendary Marshal Jozef Pilsudski in the struggle for Poland’s future. I was named after my grandfather and my brother’s middle name is Jozef. 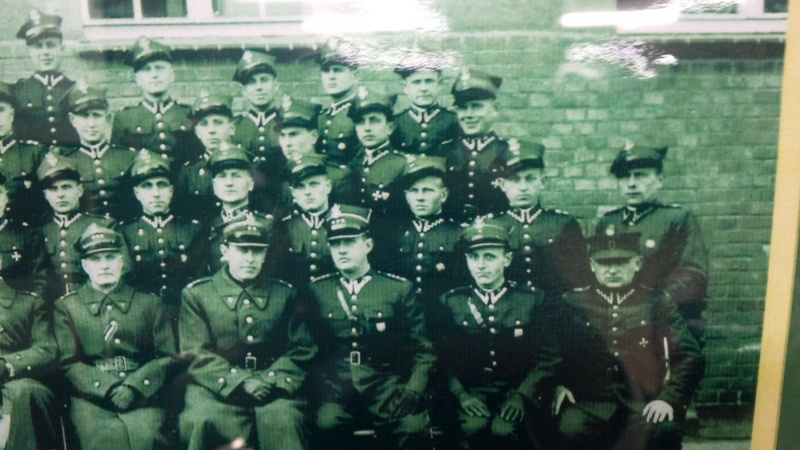 Any more information about the group in this photograph would be gratefully received. One clue can lead to another! This entry was posted in Uncategorized and tagged Army, Kipling, Pilsudski, Poland, Survivors, WW1, WW2, Zaleski. Bookmark the permalink. Lucjan Załęski fought in the 1919-21 Polish-Soviet war – not WW1. The newly formed Second Polish Republic effectively stopped the Soviets crossing Poland for what Lenin saw as assisting other communist movements in Europe. As a fifteen to seventeen year old schoolboy, Lucjan Załęski was decorated twice in defending his country. He then continued his studies and graduated from high school in Krzemieniec (now Ukraine) although he had grown up in Warsaw. From there he went to infantry training school and officer school. 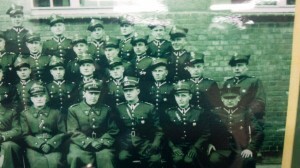 This photo was taken with all the other officers in the 74th Upper-Silesian Infantry Regiment based in Lubliniec, Poland. At the time, Lucjan Załęski was a Captain and Lubliniec was close to the pre-WW2 border with Germany. During the September Campaign, Captain Załęski was mentioned several times in dispatches. He was interned by the Soviets until the Soviets joined the Allies. He survived the war and went back to Poland eventually achieving the rank of Lieutenant-Colonel and Chief-of-Staff of the 3rd Infantry Division. In 1948 due to his intelligence, leadership, influence, experience in Anders 2nd Corps, background and education he was arrested and tortured by the NKVD in a high profile case as a threat to the control of Poland by the Soviet Union. He eventually died under torture never giving or agreeing to the false accusations meant to discredit him.